Very few organisms cause more problems of significance to a winemaker than our old friend Brettanomyces, or its sporulating analogue Dekkera. Brettanomyces is traditionally managed through approaches such as robust winery hygiene, the minimisation of available food sources in wine, and ensuring adequate SO2 and pH levels. Nevertheless, this organism is persistent enough to survive these treatments and most wine physiochemical parameters. Killbrett is a new product from Lamothe-Abiet that is toxic to several microoganisms, including Brettanomyces/Dekkera, and as such provides a significant improvement to the management of this troublesome spoilage yeast. Brettanomyces impact on wine can take several forms, none of which are positive. The organism is highly resistant to ethanol and SO2, which makes winery management difficult. At best, “Bretty” characters can be said to add to the complexity of wine, if present at sufficiently low levels. Since the organism can survive in generally hostile environments, this is rarely the case, with the usual outcome being spoiled wine. The main descriptors used for describing Brettanomyces characters are plastic, smoky, medicinal, horsy, band-aid and, in some circumstances, mousy (Snowdon et al, 2006). The main chemical compounds produced by Brettanomyces that are responsible for these unpleasant descriptors are collectively referred to as “volatile phenols”, so named because they are easy to smell (generally: mousy taint is typically perceived in-mouth rather than by smell) and contain a phenol moiety in their chemical structure. Chief amongst these are 4-ethylphenol (4EP) and 4-ethylguaiacol (4EG). Other unfavourable compounds produced by Brettanomyces are acetic acid and isovaleric acid, a rancid-smelling compound. The organism is fairly large, typically 1-2um, so removal by filtration is not difficult. Of greater concern is the prevention of regrowth, which mandates attention to winery hygiene and close monitoring of wine physiochemical parameters. Oak, too, plays a role, and it has been anecdotally noted that new oak yields higher Brett infection rates than old. Wines are at significant risk of Brettanomyces infection between primary and secondary fermentations, due to factors such as low SO2, the availability of organic nutrition and the absence of other organisms to occupy the microbiological niche. In part, this intrinsic infection risk was a driver for the investigation of the feasibility of co-inoculation of yeast and malo-lactic bacteria, with the idea being that the microbiological niche would not be void, thereby excluding Brett. Other factors too sometimes drive the attractiveness of co-inoculation, such as cold temperatures or market pressures, but a primary driver is risk management. Lamothe-Abiet conducted some of the earliest work in co-inoculation in Bordeaux over 15 years ago. Once Brettanomyces becomes established, it makes its presence known through the production of undesirable aromatic compounds. There is a sequence to the production of these compounds, part of which is exacerbated by the choice of enzymes and yeast used during production. This chemical sequence is outlined in Figure 1. Figure 1. The sequence of production of 4EP (R = H) and 4EG (R = OCH3) in a Brettanomyces-infected wine. Enzymes are indicated in blue text. Cinnamic acid esters occur naturally in grapes. The tartaric ester is depicted in Figure 1 (a). When processing enzymes are used that are not purified, cinnamyl (or cinnamoyl) esterase is present, and it converts the ester (a) to its free acid form (b), releasing tartaric acid. The cinnamic acid can then be converted to the vinyl phenol (c) via the action of cinnamyl decarboxylase. This enzyme is present in most yeast, though absent (or present at very low levels) in “POF-“ yeast. POF = “phenyl off flavour”, a reference to the production of vinyl phenols, (c). 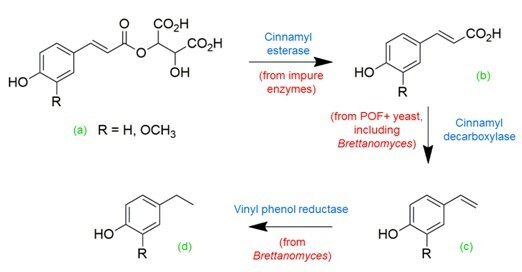 POF+ yeast have higher levels of cinnamyl decarboxylase, and so provide a more efficient conversion mechanism. Brettanomyces performs this conversion well, leading to high levels of vinyl phenols in the wine. Vinyl phenols tend to have a plastic smell, but at low levels mute fruity aromatics. It is for this reason that the use of POF- yeast for primary fermentation generally yields a more fruity wine, or at least one with cleaner aromatics. The final phase of 4EP and 4EG synthesis is the reduction of the vinyl moiety to the corresponding ethyl group, yielding structure (d). Both compounds (c) and (d) are pungent due to their low molecular polarity (Bowyer, 2003), and so the spectrum of Brettanomyces-derived aromatics is obtained. 1. Use purified enzymes, to eliminate the presence of cinnamyl esterase. 2. Use POF- yeast, to reduce the impact of cinnamyl decarboxylase. 3. Minimize the presence of Brettanomyces through best winery practices. Minimizing the presence of Brettanomyces is no simple task. If it were easy, Brett would not be the problem that it is for the global wine industry. Recent trends towards using lower levels of SO2 have the potential to increase the risk of infection. What then is the best way to kill this problematic organism? Killbrett does exactly what the name implies: it kills Brettanomyces, in addition to other microorganisms such as lactic acid bacteria. The principal component of Killbrett is chitosan, a natural polysaccharide (Figure 2) obtained through N-deacetylation of the parent polysaccharide, chitin. There are several sources of chitosan, but only one is approved for oenological use: fungus! Typically this will be Aspergillis niger. In wine, due to the low pH, some of the amine groups take on a proton to become charged (NH3+), and it is this charged form that is active against micro-organisms. Figure 2. The structure of chitosan, the active component in Killbrett. Killbrett works in two different ways. A seminal study by Taillandier et al (Taillandier et al, 2014) yielded very interesting data, that are extremely relevant to the wine industry. Firstly, there is a physical effect of chitosan on Brettanomyces. The polysaccharide strands, when in contact with cell walls, cause flocculation and sedimentation, physically dragging the Brettanomyces cells from the wine (Figure 3; reproduced from Taillandier et al, 2014). Figure 3. Reproduced from Taillandier et al, 2014, the images show adsorption of the Brettanomyces cells to chitosan through a haemocytometer. (a) = control (no chitosan); (b) = chitosan @ 400 ppm after 20 minutes. Secondly, there is a biological effect of chitosan on Brettanomyces. The authors speculate that cell lysis occurs due to a chitosan-induced increase in cell permeability. This is evidenced and quantified through the measurement of adenosine triphosphate (ATP) in the medium, the molecule of intracellular energy. In their experiments release of ATP from the Brettanomyces cells was rapid (< 1 hour), with higher concentrations of chitosan yielding faster release. The researchers also observed an inhibitory effect on the growth of Brettanomyces in the presence of chitosan, even in the presence of residual sugars, and they go on to suggest racking off the wine after a few days to further inhibit the organism. We speculate that the inhibitory effect of chitosan against the regrowth of Brettanomyces is due to the variations in size of the polymer. Since Killbrett is not a discrete molecule, but is rather a distribution of polymers of varying sizes, it is reasonable to assume that the smaller polymer fragments will settle over a longer time than larger fragments. We suggest it is these smaller polymeric fragments that provide the inhibitory effect post-racking from the initial treatment. If you find yourself in the unfortunate position of a Brettanomyces infection in a tank or barrel, you now have a new tool available: Killbrett. The suggested course of action is product application with strong homogenisation, followed by racking after 10 days. For a preventative treatment, application with periodic stirring is advised, with monitoring of cell populations. Remember, chitosan is the active ingredient in treating Brettanomyces in this manner, and Killbrett is 100 % chitosan. Always check the recommended dosage and maintain other chemical parameters such as pH and SO2. Bowyer, P. K. (2003) Molecular polarity – it’s behind more than you think, Australian and New Zealand Grapegrower and Winemaker, November issue, 89-91. Snowdon, E., Bowyer, M. C., Grbin, Paul R., and Bowyer, P. K. (2006) Mousy Off-Flavor: A Review, Journal of Agricultural and Food Chemistry, 54, 6465-6474. Taillandier, P., Joannis-Cassan, C., Jentzer, J.-B., Gautier, S., Sieczkowski, N., Granes, D> and Brandam, C. (2014) Effect of a fungal chitosan preparation on Brettanomyces bruxxelensis, a wine contaminant, Journal of Applied Microbiology, 118, 123-131.